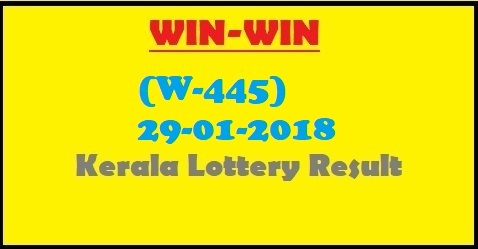 Kerala state lottery result for WIN-WIN has been announced and result displayed below for WIN-WIN LOTTERY NO. W-445th DRAW held on 29/01/2018 At Sree Chithra Home Auditorium, Pazhavangadi, East Fort, Thiruvananthapuram. Next WIN-WIN Lottery Draw will be held on 05/02/2018 at SREE CHITHRA HOME AUDITORIUM, PAZHAVANGADI, EAST FORT, THIRUVANANTHAPURAM.